You were a participant in the 4th edition of the Jacques Rougerie Foundation’s International competition in Architecture, back in 2014, along with your coworkers Barbara Sopolinska and Daria Wojciechowska. Obviously, the first question that comes to our mind is: what are you up to? Although working together with Barbara and Daria was a wonderful experience and I would definitely do it again, we all took different paths in our education and careers. Barbara graduated from Aalborg University, Denmark, and is currently living and working in an architectural office in Iceland. Daria is finishing her Master’s thesis and working in Warsaw. I recently earned my Master’s degree at Delft University of Technology in the Netherlands. My graduation thesis was located in Delft, and because of that I got acquainted with Dutch architecture and culture quite well. I decided to take this opportunity and I am currently looking for a job in the Netherlands. There are many renowned offices here and I think it’s one of the best places to gain professional experience. What motivated you to participate in our architecture competition? We were all Bachelor students at Warsaw University of Technology at the time, but we were looking to get out of our comfort zone and challenge ourselves with topics that were more interdisciplinary than academic projects. We decided to participate in the competition with a strong belief that we were doing it for our personal development. I am glad we did, because we learned a lot during the process. You have won the “Coup de Coeur” award of the “Innovation and architecture for the sea” Category thanks to TheCloudCharger. What was your role in the creation process? Our tasks were not strictly divided in the beginning, we gave ourselves time for brainstorming. We did a lot of collective research concerning the issues of sea-land balance to narrow down the choice of the main topic. I came up with the idea to use seas and oceans as a resource to help solve problems of drylands. When the general concept was there, we split tasks and worked it out in details. 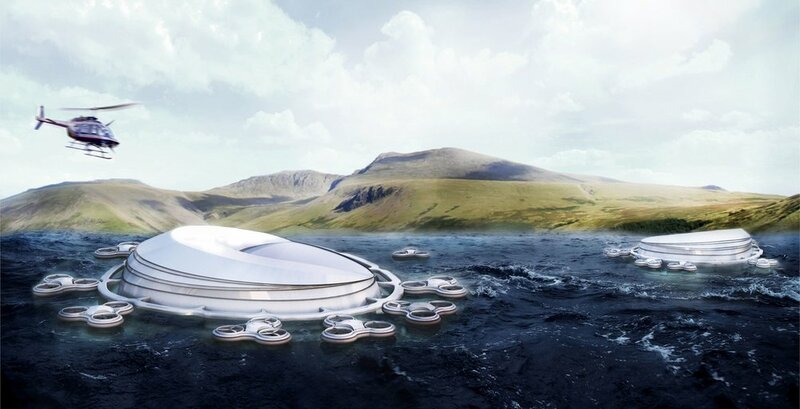 The most crucial elements in the design were: the drones as a transportation system, the system of desalination and the so-called whale baleen filtering system. In general, we had to make sure that the concept was feasible enough to be realized not in the next hundred, but five or ten years. The idea was to create a solution that responds to current problems. That’s why using already existing technology was crucial for us. We did research on existing desalination plants and drones that are able to carry heavy loads. In other words, we projected already known technology onto an issue that in our opinion was important to be solved. Machines are constantly outperforming us. Aren’t you afraid that, by using this system to desalinate water and irrigate the plants, mankind might no longer have a place in agriculture? We didn’t see our project as a major change in the way people cultivate land in different parts of the world, but as a way of maintaining it and making it easier. In opposition to our proposal, we mentioned cloud seeding as a form of weather modification that turned out to be harmful to the ecosystem. I believe that technology can help only certain aspects of agriculture without influencing the environments and human health. Did you get the chance to go further in your project’s advancement? Not yet, but as I already mentioned, I do believe that the project is feasible, or will become feasible enough in the next few years to developed further. I would love to be a part of it. We are in 2017, technology has known tremendous changes: drones, for instance, are becoming trivialized. Were you to participate to this year’s edition of the competition, do you think your project would have been the same? Of course, technology is changing all the time, but certain problems remain universal. We used technology as a means to tackle a specific topic, not as a value itself. Now, three years later, our research and response to the issue would for sure be different. For its 7th edition, the Jacques Rougerie Foundation has launched new categories in addition to the three main ones. That is, “Ports of the future” for the sea category, “Solar power stations” for the Space category and “The African coastline” for the Sea level rise category. Do these categories inspire you, personally? I think they are a good way to channel designers’ efforts into very specific issues. I would personally prefer to answer to an individual topic like “The African coastline”, as I believe it would have more chance to make an actual difference. There is, literally, an ocean of possibilities for designers, but we also have to know which issues it’s smart to focus on. Is there another project that you might want to tell us about? During my studies in Delft, I continued following my personal fascinations and trying my luck in architectural competitions. This year I participated in the international 120 hours competition with my fellow student, Edyta Milczarek. This year’s task was to design a canteen and a library for a primary school in rural China. The topic was different than the issues tackled by Jacques Rougerie Competition, and for us it was an opportunity to design a small-scale project that is feasible and site-specific. This year’s theme also shows a shift in the contemporary role of architecture – from high-tech to low-tech solutions. This project is made out of local materials and it’s easy to build with human hands using as little tools as possible.